Flicking between channels, like pages in an old book. A portrait of H G Wells – the Grand Daddy of British science fiction born in South East London – appears on the television test card within this painting. 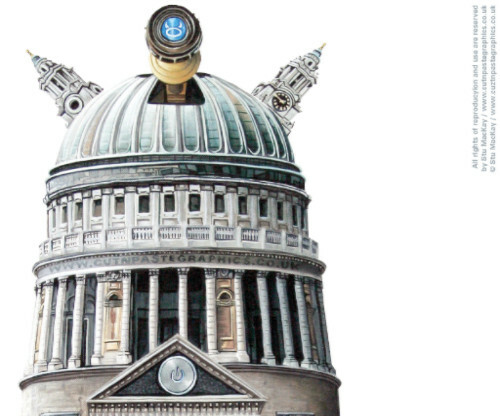 War of the World celebrates Sir Christopher Wren – the most famous of British architects – and uses his St Paul’s Cathedral, an iconic symbol of Religion dressed with the four tools of propaganda: Digital, Audio, Visual & Literature. These tools – or weapons – are juxtaposed with Raymond Cusick’s iconic sci-fi design: dictator of time and space.